Today we are going to look at a commonly used way to enter a trade. There are various ways we can enter into a position including market orders, limit orders, and stop orders. We are going to look at the entry stop order, commonly referred to as a straddle, to see how we can benefit from these types of entries as well as touch on some straddle basics. These are different than a stop loss as they are used to get us into a trade while stop losses get us out. An entry stop order places you into the trade once the price has begun to move in the direction you want it to. So, if you want to go long a trade you will enter a buy stop and if you want to go short a trade you will enter with a sell stop. One of the reasons for using an entry stop is to allow the price action to move in your favor before entering the trade. This means that you will look for a setup, then identify the price you want to enter the trade. For example, if you get a buy signal on your trading system, you then would decide on the price to enter the trade. So if the current price was 1.2340 and your entry rules were met you might place your entry buy stop at 1.2345 to enter the trade. This would allow you to get in as the price is moving in your favor. The reverse would be true for short trades. 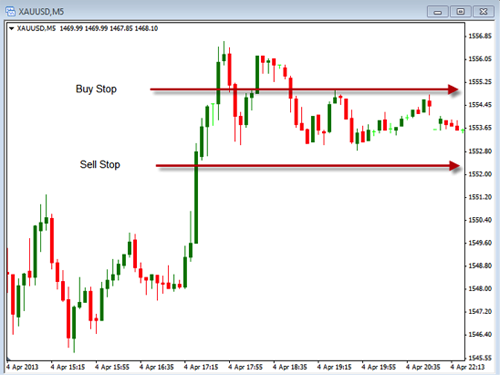 Take a look at the chart below as it illustrates another use for the entry stop orders. In this chart above you can see two areas for a possible entry. The top line is a buy stop and the bottom line is a stop. Currently the price is sitting between these two areas. In order to have the trade executed the price would need to move either above the buy stop level or below the sell stop level. In this example the price of gold would need to show some directional movement in order to be entered into a position. With straddles, you don’t necessarily care of the direction it is going to move, you just want it to move in a direction. This is done often times right before a news announcement in anticipation that the reaction to the news will be strong and cause a significant move in the price. Once the price moves strongly in one direction you will be entered into the trade. After the direction has been chosen and the entry stop has been filled you will want to cancel the opposite pending order so you don’t get it filled also. This is just one example of how to use an entry stop order. There may be other ways you can use it to help improve your trading method. Take some time to review how to place these trades so you have the option to use them as ways to enter trades. As we learn to use various way to enter a trade we are improving our trading process by giving us different ways to approach our entries.